Note: Sound clips are shown by the name of the song being in underlined bold italic red text. Click the name and your installed MP3 player will start. 1. The Pioneer Schottishe (or Alligator Hop); 2. Bottle-o Schottische; 3. Old Dan Tucker; 4. Green Leaves Polka / The Girl I Left Behind; 5. Ebb Wren’s Schottische / Life Gets Tedious Polka; 6. Galopede; 7. So Early In The Morning / Donkey Riding; 8. The Bulletin Polka; 9. Jenny Lind Polka / The Black Cat Piddled In The White Cat’s Eye; 10. The Banks OF The Condamine; 11. Susan Colley’s Varsoviena / Cunnamulla Stocking Jig; 12. Australia Jim / Mudgee Schottische; 13. Merryland’s Jig / Murray’s Hornpipe; 14. Ask Old Brown For Tea / The Campdown Races ; 15. Varsoviena / Put Your Little Foot Here / Eileen McCoy’s Varsoviena No. 1; 16. Pop Goes The Weasel; 17. The Gatadon Polka; 18. Starry Night For A Ramble / Little Old Log Cabin In The Lane; 19. George Kyle’s Schottische / Cosgrove’s Schottische; 20. The Springtime It Brings On The Shearing; 21. The Gumtree Canoe; 22. Girls Of Ivory / Manchester Galop; 23. Merrily Danced The Quaker’s Wife; 24. Davy Davy Knick Knack / Rakes Of Mallow; 25. The Bullocky’s Ball; 26. The Colonial Polka; 27. The Farmer He Chased His Wife With A Broom. The Australian Bush Orchestras Music for Bush Dance & Campfire is a celebration of Australian colonial instrumental music evocative of woolshed dances and the iconic bush campfire. Snippets from Fahey’s oral recordings, mostly from his field collecting in the early 1970s, bring the music to life connecting the past with the 21st century. These rare actuality recordings of musicians, all born in the 19th century, add a stamp of authenticity to the music and, Fahey hopes, an appreciation of the ongoing role of traditional music in Australian life. Having just recently finished working on Dan Worrall's House Dance CD-ROM, I thought that I knew what to expect of a CD with a title like this. Having listened to the Quadrille Mania CDs, I know what bands like the Wedderburn Oldtimers Orchestra, the Dancing Pennies, the Gay Charmers, the Emu Creek Bush Band, and Harry McQueen's Band sound like. 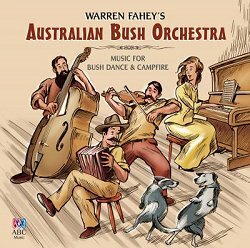 Warren Fahey's Australian Bush Orchestra doesn't sound like any of them, or accord with the contemporary descriptions of bush bands in House Dance. What it does sound like is an Edwardian Music hall pit orchestra. Here's a taste of the first track - The Pioneer Schottishe. I started by calling this a hugely enjoyable disc - and it is! The musicianship is superb throughout, and the arrangements are great fun. Anyone who's enjoyed Dan Quinn's Duck Soup will surely love this, too. If not - then I'm sorry for you! The 'Snippets from Fahey’s field recordings', alluded to in the above quote, are snatches of conversation with several traditional performers - principally Susan Colley, who sings bits of songs and plays anglo-concertina. We also get a couple of verses of The Gumtree Canoe from Jimmy Cargill, and a couple of melodeon tunes from the great Sally Sloane. This has been very cleverly done - these archival clips have quite a lot of echo on them, so that whilst you seem to be close-up to the band, these conversations sound as if they are actually taking place in the same room, but 'over there' somewhere, several yards away. Very effective - as with Ebb Wren’s Schottische. When the blurb calls it 'instrumental music evocative of woolshed dances', this may be true of the tunes themselves, but not of the presentation here - this is not dance(able) music, there are too many gaps and changes of tempo and bar length for that. But it's very well played and terrific to listen to. Only in a couple of instances do the band get a bit carried away, and play far too fast for dancing - or their own comfort! Working on Dan Worrall's House Dance CD-ROM alerted me to something I've been peripherally aware of for a good while - that much of the world shares a basic repertoire of tunes which pread very widely since the mid-19th century, and was subsequently particularly enhanced by the gramophone and radio. You can find similar tunes for the varsovienne scattered across most of the globe. Obviously, in the case of Australia, much of their early music came directly from these islands, and it's great fun to spot loads of the tunes on this CD that you already know in slightly different versions. As a couple of examples: a tune I know as a Scan Tester schottische turns up here as the Manchester Galop; while our local Gloucester Hornpipe resurfaces as Murray’s Hornpipe.